The United Republic of Tanzania is a country located in East Africa and bordered by Kenya and Uganda to the north, Rwanda, Burundi and the Democratic Republic of the Congo to the west, and Zambia, Malawi and Mozambique to the south. The country's eastern borders lie on the Indian Ocean, and include the autonomous region of Zanzibar. Tanzania's total area is 945,203 km2 (364,898 sq. mi.) and the estimated population in 2010 was 42,746,620. Its topography includes Africa's highest peak (Kilimanjaro), Africa's largest lake (Victoria [Nyanza]), and Africa's deepest and longest lake (Tanganyika). The Great Rift Valley bisects the nation from north to south. The climate is low-latitude wet and dry, with heavy rains from March to May, a dry season from June to October, short rains from November to December, and a short dry season in January and February. The natural vegetation is savanna grassland with scattered thorn forest. Several national parks with wild animals have been established. Source: Mennonite Encyclopedia, v. 5, p. 872. Tanzania is probably one of the oldest known inhabited areas on Earth; fossil remains of humans and pre-human hominids have been found dating back over two million years. Approximately two thousand years ago, Bantu-speaking people began to arrive from western Africa in a series of migrations, followed by Nilotic-speaking people through to the 18th century. From the 12th to the 15th centuries the Arabs had a flourishing trade on the east coast. The Portuguese in the 16th century ravaged the main port city Kilwa and other coastal cities, but the Arabs continued the slave trade from Bagamoyo. In the 19th century two German missionary explorers, Johann Ludwig Krapf and Johannes Rebmann, gave Germany a basis for its claim to Tanganyika, and by the late 19th century, Imperial Germany conquered the regions that are now Tanzania (minus Zanzibar), Rwanda, and Burundi, and incorporated them into German East Africa. Great Britain recognized this claim in return for Zanzibar and Heligoland. The post–World War I accords and the League of Nations charter designated the area a British Mandate, except for a small area in the northwest, which was ceded to Belgium and later became Rwanda and Burundi. After World War II it became a trust territory under United Nations. Tanganyika achieved independence on 9 December 1961, while Zanzibar achieved independence on 10 December 1963. 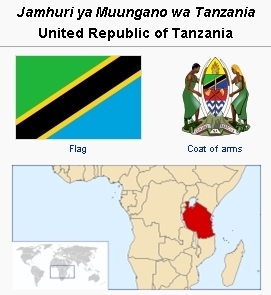 The two nations united on 26 April 1964 to form the United Republic of Tanganyika and Zanzibar, which later the same year was renamed the United Republic of Tanzania. Julius Nyerere, who launched the movement for independence in 1954, became Tanganyika's first president in 1962. The capital was transferred from Dar es Salaam inland to Dodoma. The socialist economy was being relaxed in the 1980s to allow for more private enterprise. In the 1980s Tanzania was one of the poorest nations in the world, but was determined to fend for itself. Its war with Uganda to drive Idi Amin from power (1978-1979) increased the poverty; shortages of fuel and basic supplies were commonplace. The government changed its socialist policies beginning in 1986 and devalued its currency. It has depended on sisal, coffee, cotton, tea, gold, diamonds, and tourism for income. In spite of poverty Tanzania had the highest literacy rate in Black Africa. Universal primary education was undertaken in 1977 and adult literacy programs helped increase literacy to over 50 percent. The African population consists of more than 120 ethnic groups, of which the Sukuma, the Nyamwezi, the Chagga, the Nyakyusa, the Haya, the Hehe, the Bena, the Gogo and the Makonde all have more than 1 million members. Other groups include the Pare, Zigua, Shambaa and Ngoni. The majority of Tanzanians, including such large ethnic groups as the Sukuma and the Nyamwezi, have Bantu origins. Groups of Nilo-Hamites or related origin include the nomadic Maasai and the Luo. Non-Africans residing on the mainland and Zanzibar account for 1% of the total population. A 2009 study suggested that 62% of the population of Tanzania was Christian, 35% was Muslim, and 3% were members of other religious groups. 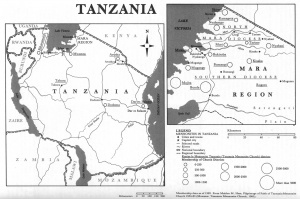 Mennonite mission efforts date from 1934, and resulted in the Kanisa la Mennonite Tanzania (Tanzania Mennonite Church) whose autonomy was recognized in 1960. After the church received government recognition, the mission was dissolved. Lancaster Mennonite Conference (MC) and its mission board (Eastern Mennonite Board of Missions and Charities) now related directly to the Tanzania church assisting with limited personnel and finance. In 1961 Mennonite Central Committee (MCC) established its Teachers Abroad Program in Tanganyika, providing teachers in schools managed by government and other denominations. The MCC program has been enlarged to include medical and community development personnel. Between 1978 and 2009 the Kanisa la Mennonite Tanzania grew from a membership of 10,045 in 1978 to 64,534 in 2012. Anchak, George R. "Experience in the Paradox of Indigenous Church Building: History of the Eastern Mennonite Mission in Tanganyika, 1934-1961.” PhD thesis, Michigan State U., 1975. Hess, Mahlon M. Pilgrimage of Faith: Tanzania Mennonite Church, 1934-83. Salunga, PA: Eastern Mennonite Board of Missions and Charities, 1985. Originally appeared in Swahili as Safari Ya Iman. Kraybill, Paul N., ed. Mennonite World Handbook: A Survey of Mennonite and Brethren in Christ Churches, 1978. Lombard, IL: Mennonite World Conference, 1978. MCC in Tanzania. Mennonite Central Committee. Web. 12 October 2008. http://mcc.org/tanzania/. Mennonite World Handbook Supplement. Strasbourg, France, and Lombard, IL: Mennonite World Conference, 1984: 16. Wikipedia. "Demographics of Tanzania." Web. 20 April 2011. http://en.wikipedia.org/wiki/Demographics_of_Tanzania. Wikipedia. "Religion in Tanzania." Web. 20 April 2011. http://en.wikipedia.org/wiki/Religion_in_Tanzania. Wikipedia. "Tanzania." Web. 20 April 2011. http://en.wikipedia.org/wiki/Tanzania. Wenger, Daniel L. and Richard D. Thiessen. "Tanzania, United Republic of." Global Anabaptist Mennonite Encyclopedia Online. April 2011. Web. 21 Apr 2019. http://gameo.org/index.php?title=Tanzania,_United_Republic_of&oldid=122599. Wenger, Daniel L. and Richard D. Thiessen. (April 2011). Tanzania, United Republic of. Global Anabaptist Mennonite Encyclopedia Online. Retrieved 21 April 2019, from http://gameo.org/index.php?title=Tanzania,_United_Republic_of&oldid=122599. Adapted by permission of Herald Press, Harrisonburg, Virginia, from Mennonite Encyclopedia, Vol. 5, pp. 871-873. All rights reserved.